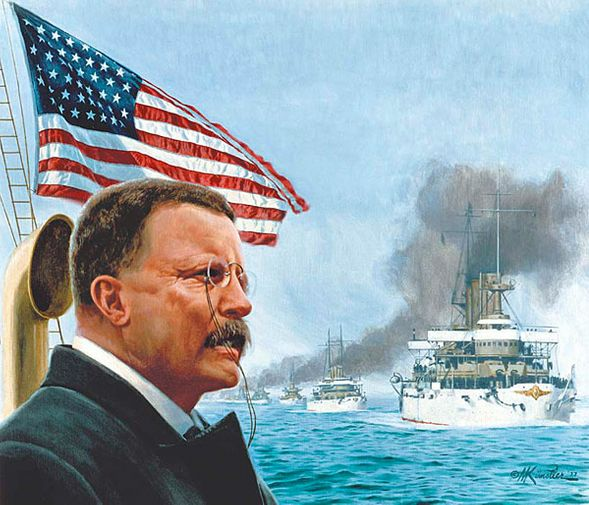 Mort Kunstler Handsigned and Numbered Limited Edition Giclee on Canvas:"Great White Fleet Sails, The"
About the Art: At 10:00 a.m. on December 16, 1907, President Theodore Roosevelt gave the order. With a tug on the halyard, tightly wrapped cloth bundles at the yardarm broke open into brilliantly colored signal flags with the order "Proceed upon duty as assigned," and sixteen of America's proudest battleships painted immaculate white to symbolize peace got under way for what was to be a 46,000 mile voyage around the world. To Roosevelt, the ships and their mission were symbol and substance of America's proclamation to the whole world that she was assuming a broader obligation toward maintaining world peace than ever before.